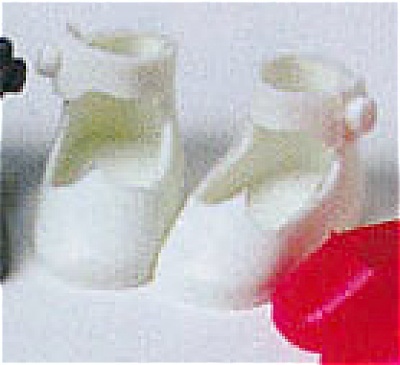 White Mary Jane style Plastic Doll Shoes with straps and buttons are reproductions of the shoes that American Character used for Tiny Betsy McCall dolls in the late 1950s and early 1960s. These shoes fit the Robert Tonner and Effanbee Tiny Betsy dolls, the Tonner Tiny Ann Estelle dolls, Tonner KickIts, and other slender Tonner 8 inch dolls. The price is for a single pair of shoes. Lower priced insured First Class Mail shipping is available by request in the comments section of the order form for orders of 1-4 pair of shoes. New, mint.